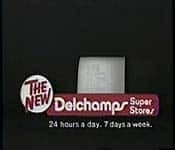 Delchamps was an American grocery store chain based in Mobile, Alambama. It was founded by Alfred Delchamps in 1921. In 1997 the chain was bout out by Jitney Jungle which was ill advised and in 1999 they filed for bankruptcy and all the stores were sold.